Natural Church Development (NCD) is a principle-oriented way of approaching the Christian life that strives to integrate biblical standards and empirical learnings. The growth principles identified by international research and communicated in the NCD books can be applied both by individuals (church members, active believers, nominal Christians, non-Christians) and at a corporate level (local churches, small groups, denominations, para-church organizations, etc.). NCD has developed an extensive toolbox targeted at helping people relate the principles to their specific contexts and needs. All tools of Natural Church Development are focused on increasing the quality of the Christian life. NCD research indicates that this investment in quality, i.e. increasing health in individuals, is key to activating quantitative growth, i.e. increase of churches and Christianity as a whole (Schwarz 2006). While the publication of the book, Natural Church Development in 1996, is generally considered the launch of Natural Church Development as a worldwide movement, the research presented in that book and the theory developed through observing church life and evaluating the insights in terms of biblical criteria, has a longer history. In the late 1970s, Fritz Schwarz, a Lutheran superintendent of the church district of Herne (Germany), developed a missional program targeted at (a) helping nominal church members experience a spiritual transformation through a personal encounter with Jesus Christ, (b) forming communities of committed believers within the context of the Lutheran church, and (c) empowering them to share what they have received by outreach to their neighborhood (Schwarz/Schwarz/Sudbrack 1979-1981). This program, which had been strongly inspired by the writings of the German theologian Dietrich Bonhoeffer, emphasized integrating the dimensions of evangelism and social service, indicated by many activities focused on ministry to the marginalized and the Third World. Two books in this early phase that have been authored by Fritz and Christian A. Schwarz, dealt exclusively with the societal and political impact of discipleship and church life. The first one, Program of a New Life Style (Schwarz/Schwarz 1981), targeted topics such as ecology, global social justice, ministry to the poor, and a simple personal life style, while the second one, The Lie of Peace (Schwarz/Schwarz 1982), addressed topics like armament, non-violent resistance, and peace. Even if the authors rejected the label "model" for their approach, their program functioned as a model for many congregations throughout Germany, primarily in the context of the Lutheran church. In 1984, Fritz and Christian A. Schwarz co-authored their Theology of Church Development (Schwarz/Schwarz 1984) which presented the theological paradigm behind the practical work. At the time of publishing that book, there had not yet been any interaction with the American church growth movement (as pioneered by Donald A. McGavran and C. Peter Wagner). In the years to follow, Schwarz developed a relationship with McGavran in which they explored the elements that were potentially missing in the predominant church growth paradigm of the day. In 1986, Christian A. Schwarz spent a sabbatical in the U.S.A., and studied church growth at Fuller Theological Seminary. From a critical evaluation of the church growth literature that was available at that time, together with the paradigm that had been developed in Germany, he came up with a first provisional list of about 300 items that may characterize growing churches. He developed a survey for churches in German-speaking Europe to find out, which of these items had a correlation with numerical growth, and which not. This resulted in the development of a new survey that was tested in 120 churches in Germany, Austria, and Switzerland. The results were published in the book, Practice of Church Development (Schwarz 1987). At that time, the hypothesis was that there are seven essential qualities of healthy churches. After further evaluation of churches that worked with the original assessment tool, a new generation of that tool was made available to the public in 1991. The book The Church Test (Schwarz 1991) which described the overall approach, featured for the first time what was later called the six growth forces, which originated from empirical discoveries and evaluating them both in the light of Scripture and ecological research, especially by the German biochemist Frederic Vester (Vester 1980). In 1989, Christian A. Schwarz founded the Institute for Church Development, which was later renamed Institute for Natural Church Development. In 1994, the organizational psychologist Christoph Schalk joined the Institute’s team. Under his supervision, 1000 churches in 32 countries were researched according to a revised methodology, applying strict standards in terms of objectivity, validity, and reliability (Schwarz/Schalk 1998, pages 229-234). In October of 1996, the first edition of the book Natural Church Development (Schwarz 2006) was published simultaneously in ten different language editions (British English, Croatian, Danish, Dutch, French, German, Portuguese, Russian, Spanish, U.S. English). This was the first time that the term "Natural Church Development" was used. Meanwhile, the book has been published in many more languages, including Albanian, Arabic, Chinese, Czech, Estonian, Finnish, Hindi, Hungarian, Icelandic, Indonesian, Japanese, Korean, Norwegian, Polish, Romanian, Swedish, Tamil, Thai, and Ukrainian. At that time, the Institute for Natural Church Development started to look for NCD National Partners, who help support churches in their respective language areas by training, coaching, and practical tools. The first generation of tools (NCD 1.0), targeted the church as a whole. The major resources in this phase were the books, Natural Church Development, Implementation Guide to Natural Church Development, and the NCD Church Survey. In this phase, NCD was a popular topic especially among pastors and denominational leaders. 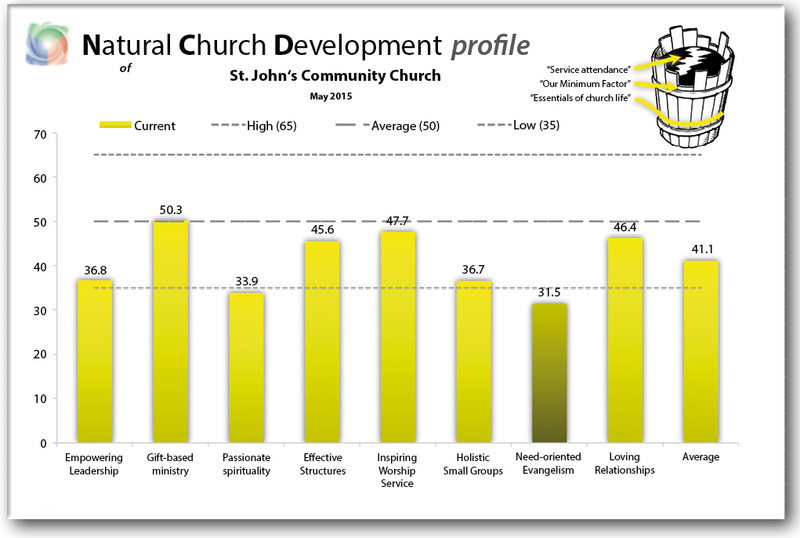 In the second generation (NCD 2.0) the target group was enlarged by highlighting that church development is people development, and that healthy churches are made up of healthy Christians. This is the theme of the book, Color Your World with Natural Church Development and the books published in the “3 Color Series” (NCD Discipleship Resources). This approach became popular at the grass-root level through the introduction of the Trinitarian Compass, a theological paradigm that formed the foundation of all succeeding NCD tools, demonstrating how developing spiritual health relates to people’s heads, hands, and hearts (first introduced in The Threefold Art of Experiencing God, Schwarz 1999b). The latest phase in the development of the NCD resources is characterized by providing a wide range of web-based assistance to people who are interested in personal or corporate growth. This is supposed to enable any individual, regardless of whether or not they have a leadership position in a church, to put into practice what is most relevant for them right away, and to continually track their progress and setbacks with the help of online evaluation tools. The central part of this strategy is a new generation of eTests (e.g., Gift Test, Communal Test, Empowerment Test) targeted at releasing God-given resources within people. This focus on immediate implementation is strongly enhanced by the discovery of the New Testament concept of divine energies (Schwarz 2015). Because of the widened focus between NCD 1.0 and NCD 3.0, NCD International decided at its 20-year anniversary in July 2016 to give the "C" in NCD a threefold meaning: it stands for "character" and "community" as well as for "church." A chief characteristic of the NCD paradigm is that all resources are developed on the background of extensive international research that is conducted according to strict standards in terms of objectivity, validity, and reliability (Schwarz/Schalk 1998, pages 229-234). This applies both to the NCD Church Survey and to the various eTests that are integrated in the books of the NCD Discipleship Resources series. By 2016, NCD International had collected data from more than 70,000 churches in 84 countries, which enable previously inaccessible insights into the relationship between quality and quantitative growth. In his research report, Christoph Schalk illustrates with reference to a small number of churches which research methods have been applied in the development of the NCD Church Survey (Schalk 1999). The strong focus on international and interdenominational research is meant to provide three practical benefits: (1) The identification of universal principles that apply regardless of culture, theological orientation, or church size; (2) The development of scientific tests that help each user analyze their current situation; (3) The possibility of verifying or falsifying many theological stereotypes that have played an influential role in both academic and popular discourse, but are usually not approached from an empirical point of view (Schwarz 2005, pages 82-83; Schwarz 2006, pages 18-21). NCD states a commitment to not feature any specific church model, but to communicate the principles that can be detected behind any successful model (Schwarz 2005, pages 132-143). In the latest generation of tools that have been published in various denominational applications, it is demonstrated how the application of NCD principles have helped various denominations or movements to revitalize their own best traditions, thus becoming more attractive within their given contexts. Since the research has been conducted in 84 countries, the features of the NCD paradigm have been taken from different cultures. The book, Color Your World with Natural Church Development, highlights how the specific strengths of the West, the East, and the South have enriched NCD strategy (Schwarz 2005, pages 28-32). In particular, NCD strives to integrate insights of the Eastern Orthodox and the Western Church traditions, making the learnings of the East accessible to the West and vice versa (Schwarz 2012a, pages 23-26). The strong focus on research is meant to provide to any user scientifically-designed evaluation tools that help them identify their respective starting points, and the possibility to monitor their progress after a given time (Schwarz 2006, pages 18-21). NCD rejects the practice of making numerical growth a strategic goal. Rather, it strives to increase the quality of individuals and churches in a way that can be measured and monitored. Following that path, it is claimed that the numerical growth follows "all by itself" (Schwarz 2005, pages 25-27). A feature that permeates all NCD resources is the focus on "radical balance," which is seen as a key to spiritual fruitfulness (Schwarz 2005, pages 168-181). NCD resources are intended to get people into an ongoing process of growth. By conducting a repeat test after a givent ime, any individual and church can identify the factor that they should now focus on in order to reach the next level of health and maturity (Schwarz 2006, pages 108-125). While the way in which churches in different cultures or denominations put these principles into practice may differ considerably, NCD claims that the underlying principles are the same worldwide (Schwarz 2006, pages 18-50). Natural Church Development is based on a bi-polar paradigm, striving to integrate poles that are often seen as contradictions, particularly in cultures that are shaped by thinking in terms of binary opposition. 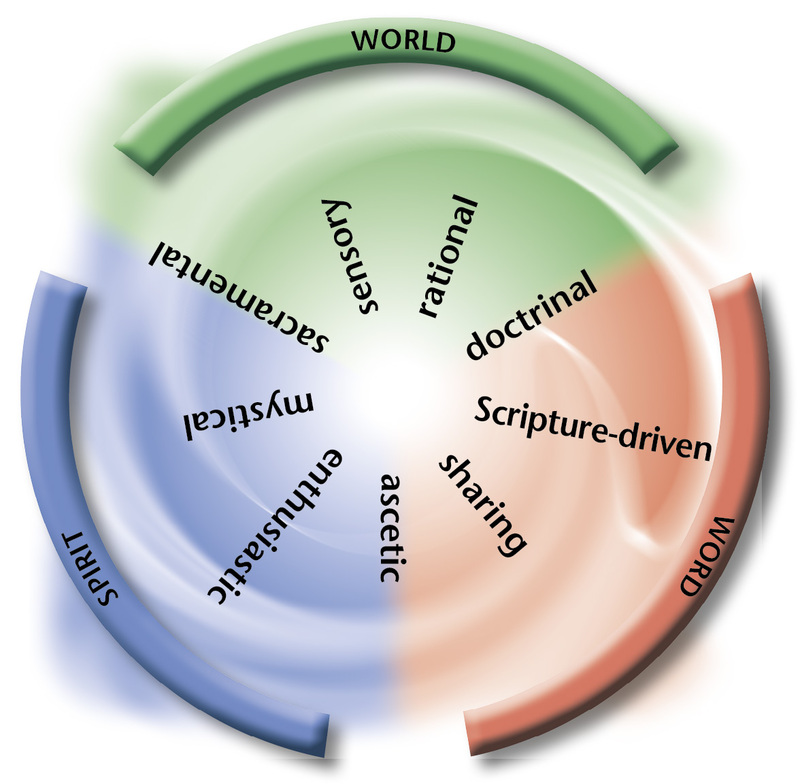 This approach has been first introduced in the book Paradigm Shift in the Church (Schwarz 1999a) by relating it to various aspects of ecclesiology and illustrating it with reference to the major conflicts throughout church history. The core of this paradigm has been inspired by the biblical representations of church in a unique combination of static (technical) and dynamic (organic) images, such as, "living stones," "growth of the temple," "the body of Christ may be built up," "God’s field and God’s building," etc. (Schwarz 2006, pages 88-89) and has later been deepened by studies of the polar structures in other fields, particularly in the theology of Dietrich Bonhoeffer (Bonhoeffer 2009), the writings of Niels Bohr (Fischer 1987) and in various schools of Asian philosophy. Behind each of the eight quality characteristics are six growth forces (Schalk 2006) that have been inspired by the study of creation, especially through biological and ecological research: interdependence, multiplication, energy transformation, sustainability, symbiosis, fruitfulness. All of the growth forces describe different ways of releasing what NCD calls the "all by itself principle" (Schwarz 2006, pages 51-64). In the NCD tools, this is described as the strategic core of Natural Church Development. The image of the minimum barrel inspired by Justus von Liebig: The barrel can only hold as much water, as the least developed stave permits. Graphic representations of the Trinitarian Compass are available in different variations, depending on the topic at stake. This picture shows the application to spirituality, where it distinguishes nine different spiritual styles. All of the books in the NCD Discipleship Resources series are based on the Trinitarian Compass, which is a unique feature of the NCD paradigm. It uses the dynamics of the colors of light (RGB scheme) as a way of illustrating the practical relevance of the Christian doctrine of the Trinity for the daily challenges of believers: In order to produce pure white light, the colors red, green, and blue must be displayed simultaneously. The color green is related to God’s revelation in creation; the color red, to God’s revelation in Jesus Christ; and the color blue, to God’s revelation in the Holy Spirit. Each of these three revelations corresponds to basic dimensions of life. • In order to reflect God’s "light" as fully as possible, it is essential that a balance of all three colors is pursued. • The terms used in any given adaptation of the Trinitarian Compass always aim at representing a complete picture of the topic under consideration, divided into different segments of equal importance. • The location of these segments in the Trinitarian Compass is more important than the actual terms used for describing them. • While at an individual level it may be acceptable to be one-sided in terms of one’s favorite colors, at a corporate level the goal of balance must not be abandoned. • The pursued equilibrium must manifest itself as a "radical balance", i.e. characterized by a strong presence of all the three colors, not by trying to achieve balance through reducing the strength of a given area. • For every person, it is beneficial to precisely know his or her respective color blend related to a specific topic. It explains both their strengths and their weaknesses. It also explains which kind of people they should connect with in order to complement for their own imbalances. • It is always a challenge to learn from the opposite position within the compass, but this is exactly the kind of learning that helps people move to maturity. • By striving to represent all three colors, the dynamics of "theosis" are activated: a transformative process with the goal of union with God. This very process activates what NCD refers to as "all by itself" growth. 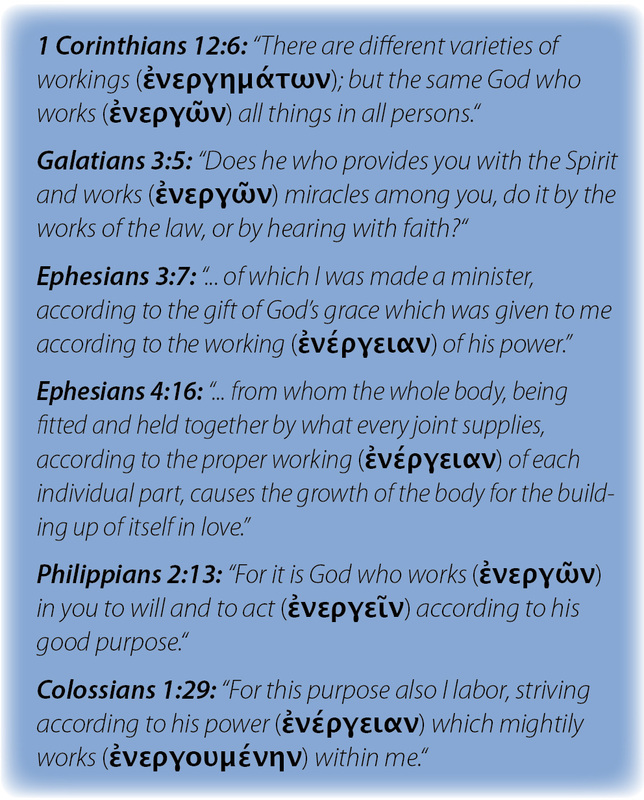 While the concept of energies is taught throughout the New Testament, the Greek noun enérgeia has almost never been translated as energy, and the verb energeo, never as energize. One of the latest contributions that is increasingly shaping the NCD paradigm is the New Testament concept of energies (Greek, enérgeia), as reflected in Schwarz 2012a, Schwarz 2015, and the newest edition of The 3 Colors of Your Gifts (Schwarz 2017). Because of translations that strove to avoid the rendering of enérgeia as "energy," the NCD authors claim that in the past the concept never had a chance to influence Western Christianity, while in Eastern traditions it is generally known, but primarily limited to the liturgical and sacramental contexts. NCD has developed an eTest that helps Christians identify their respective energies, and make use of them by investing them in the area of the corresponding quality characteristic. A graphical representation of the NCD Cycle, the chief paradigm for all implementation processes. • The process can be started in any given phase of the Cycle, since there is no statically defined beginning or end. • Every phase of the Cycle describes universally valid biblical principles rather than just programmatic ideas or tools. • It is essential not to skip any phase of the Cycle. • For different areas of implementation there are different versions of the Cycle. • The Cycle is based on the Trinitarian Compass, i.e. 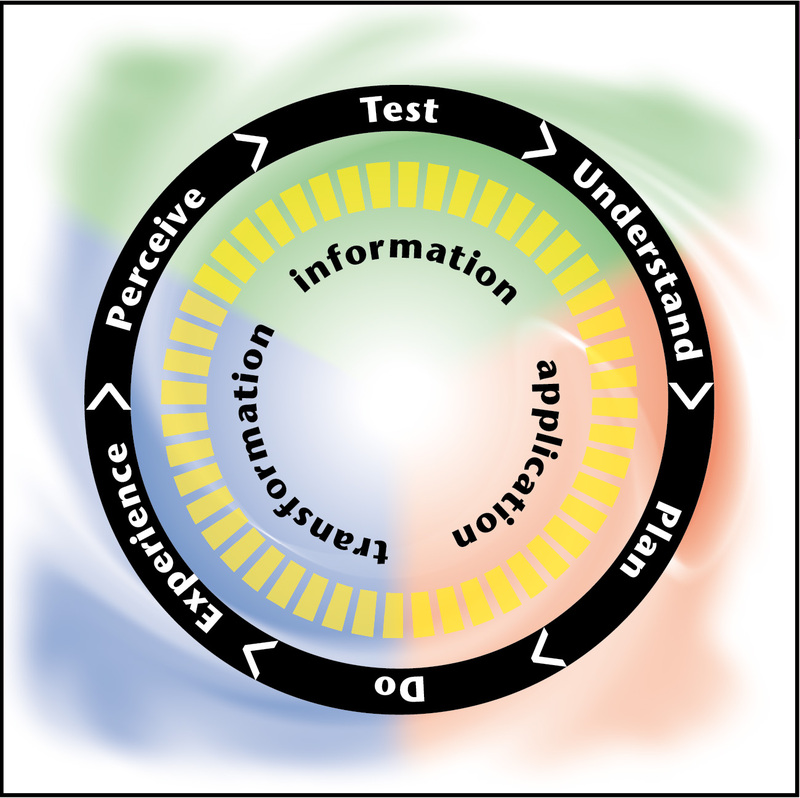 concepts such as radical balance, opposite pole, and the assignment of the six growth phases to the colors of the Compass are essential elements of the Cycle. • It is a spiral rather than a linear sequence, i.e. within each cycle the users moves through all of the phases, before going up a layer and repeating the process. NCD doesn’t position itself as a non-theological methodology nor as a merely pragmatic approach. The book Natural Church Development presents six reasons why pragmatism is unsuitable to approach church development and criticizes pragmatism as a "dead end road" (Schwarz 2006, pages 104-126). In NCD resource development, the empirical discoveries are interpreted theologically, i.e. in the light of biblical teaching. In this interpretation process, the empirical discoveries function as heuristic principle; the biblical standards, as normative criteria. It is characteristic of the NCD paradigm that the theological reflection is worked out in inter-denominational categories, deliberately not binding itself to the specific traditions or values of a given denomination. Because of that approach, the NCD paradigm strives to exclude those topics where the different branches of Christianity are in disagreement, as long as these elements are non-essentials in terms of church development. Alternatively, it is demonstrated how the different foci, if combined, can potentially contribute to healthy balance (Schwarz 2005, pages 23-24). Throughout the past two decades, NCD has developed an expanding toolbox focused on strategically increasing the quality in various areas of life. A first overview of the philosophy and procedures of NCD when applied to the local church level is given in a series of six video clips ("Mini Seminars"), each about 4-5 five minutes in lengths. NCD founder Christian A. Schwarz has recorded these clips in twelve different languages (Danish, Dutch, English, German, Greek, Indonesian, Italian, Korean, Latvian, Norwegian, Russian, Spanish). • Natural Church Development: The book was first released in 1996 and was published in a revised edition in 2006. Since the publication of this book indicates the beginning of the NCD ministry, it could not reflect any experiences with the NCD paradigm yet, but is restricted to presenting the strategy and the major research findings. Presently, the book is available in 37 different language versions. • Color Your World with Natural Church Development: This book is the most encompassing introduction to NCD, reflecting 10 years of ministry and the application both at a corporate and individual level. The book is presently available in 22 language versions. • Paradigm Shift in the Church: A theological reflection of the NCD paradigm with special reference to Systematic theology and church history. It is available in five language versions. • The All By Itself Pathway: A short introduction to NCD (reading time 90 minutes) designed to be shared with other people. At the same time, the booklet communicates the latest generation of Natural Church Development (NCD 3.0). It is presently available in 11 language versions and in a number of denominational applications. A sample page from the basic NCD profile. It indicates the strengths and the weaknesses of the church.The advanced profiles give further insights into the backgrounds of the present profile. The NCD Church Survey is the major assessment tool for local churches, that is available in different varieties (basic or detailed reports), based on the needs of the respective churches. In order to receive a profile, about 30 church members fill in a detailed questionnaire. In most countries, the NCD Church Survey is accessible online. Presently, there are five books in the NCD Discipleship Resource series, each of them covering one of the eight quality characteristics of healthy churches. All of these books are based on the Trinitarian Compass and include a personal assessment tool, either in form of an eTest or in printed form. All of them are accompanied by a number of implementation helps (visuals, coaching suggestions, small group guides, etc.). • The 3 Colors of Leadership: The book introduces the concept of Spiritual Change Talk as a means to empower other people. It includes the Empowerment Test. Presently available in eight language versions. • The 3 Colors of Ministry: The book shows how a trinitarian approach to spiritual gifts can create a positive growth dynamic exactly in those areas where the topic may have caused controversies in the past. It includes the Three-Color Gift Test. Presently available in 20 language versions. In 2017, there will be a revised version of the book under the title, The 3 Colors of Your Gifts. • The 3 Colors of Your Spirituality: The book helps each individual to discover his or or spiritual style (i.e. their individual "antenna for God") and teaches them how to interact most creatively with people who display different spiritual styles. It includes the Spiritual Style Test. Presently available in five language versions. • The 3 Colors of Community: The book introduces the concept of divine energies and shows how to discover and release of each participant’s energy can make every small group relevant both for the participants and for outsiders. It includes the Communal Test that helps each reader identify their respective energies. Presently available in seven language versions. • The 3 Colors of Love: Rather than reducing love exclusively to its soft aspects, the book strives to integrate the three dimensions of justice, truth, and grace. It includes the Fruit of the Spirit Test that is based on Galatians 5:22. Presently available in eight language versions. The eTests that are integrated in the books of the NCD Discipleship Resources, are also available as stand-alone versions. Each of them can be obtained in different versions, for the assessment of individuals or groups, as basic or detailed profile. Presently the following three eTests are available: Empowerment Test, Communal Test, Spiritual Gift Test. Most of the NCD Partners in various countries offer coaching and consulting through trained NCD Coaches. The role of these coaches is primarily to help relate the universal principles of Natural Church Development to the specific situation of a given church or individual. An eight week process focused on discovering God-given energies in each participant, and sharing one’s learnings with at least two more people. A five-minute video explains the philosophy and procedures of the process. By July 2016, the NCD Church Survey has been conducted in more than 70,000 churches, covering 84 countries and 112 denominations. NCD tools are available in 40 languages. In 65 countries, there are NCD Partners who offer support for churches and individuals who want to increase their health and see numerical growth. NCD International functions as a network that is connected to individual leaders and organizations that are committed to support Christians in their area of responsibility. The ministry is directed by Christian A. Schwarz, Christoph Schalk, and Adam Johnstone. This leadership team is supported by an informal advisory board with representatives of different cultures and denominations. The three major areas of operations of NCD International are research, resource development, and training/consulting. Some of the activities (such as publishing, web development, test construction, etc.) have been delegated to companies specifically focused on that topic (such as NCD Media, NCD International GmbH & Co KG, Journey to Life Ltd.). On the basis of their data base of some 70,000 churches worldwide and the possibility of monitoring the development in churches throughout the last 20 years, NCD International has repeatedly evaluated and published the results of the NCD ministry in empirical terms. In order to assess the average results of long-term commitment, the research team selected all churches that have conducted three or more NCD Church Surveys, and compared the scores of them at the time of the first survey with the scores at the time of the third survey. The increase between these three profiles had been 6 points on average. At the same time, the work load of the participating members decreased significantly (Schwarz 2005, page 190). Comparing the growth patterns of the same churches at the time of their first and their third surveys revealed that the growth rate within that time window increased by 51% on average. At the same time, the percentage of transfer growth (people joining from other churches) decreased while the percentage of conversion growth increased (Schwarz 2005, page 190). In his 2013 dissertation Mission-shaped Church Development, Henrik Andersen conducted both quantitative and qualitative research to evaluate the impact that an NCD process may or may not have on the mission-mindedness (in terms of actually changed behaviors) of churches. For that purpose, Andersen extracted from the missional literature five central indicators of mission-shaped churches and identified items in the NCD Survey that correspond to these features. He then selected churches that have conducted three NCD Church Surveys and researched how they developed between survey 1 and survey 3 in each of the five areas indicating the degree of their missionality. 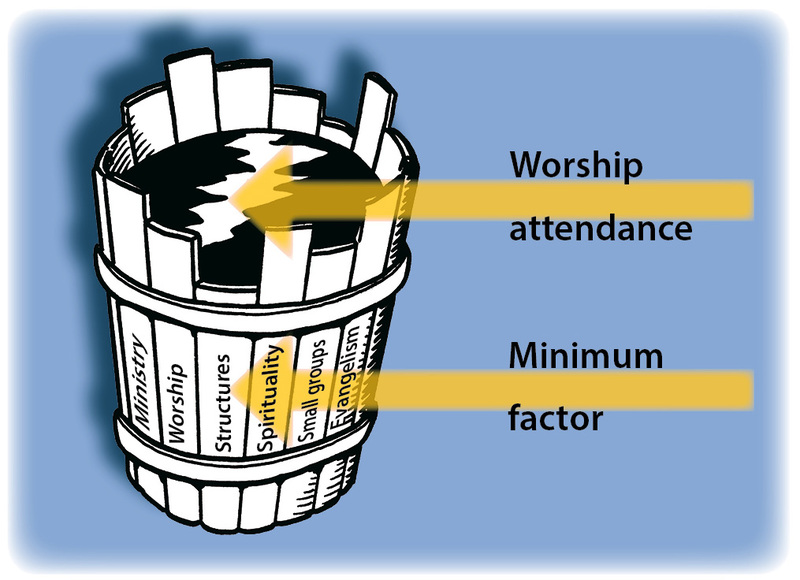 Since in all five categories the missionality of the churches increased considerably throughout the NCD process, Andersen summarized the net findings of his quantitative research in the statement: "When a church implements a Natural Church Development approach, then mission‐shaped development happens all by itself" (Andersen 2013, page 3). As a second step he did qualitative research in the form of personal interviews with each of the pastors of the churches participating in the study, in order deepen the quantitative discoveries. For instance, he asked them what their reactions would be if an active church member decided to cut down their church involvement to become engaged in a non-Christian community program. The immediate answer was, "Good on them, because they would be out there, and hopefully they would be able to put some Christian influence there" (Andersen 2013, pages 56-57). Andersen concluded that this kind of response was typical for churches involved with Natural Church Development that had experienced an increase in quality. When NCD has been applied in a whole denomination (such as diocese, church district, network, etc.) and the denominational leaders have supported the attempts of the local churches both spiritually and strategically, the leaders frequently report—apart from numerical growth—about a change of the whole climate within the denomination. On the NCD web site, there is a video section in which denominational leaders from twelve different backgrounds talk about the changes that they have seen in their area of responsibility. One of the diocese that have been a pioneer in the church-wide application of Natural Church Development has been the Anglican Diocese of Coventry under the leadership of Bishop Christopher Cocksworth.